(News release British Antarctic Survey:) London, 13 March 2019 - A major milestone has been reached on the new Antarctic wharf project at Rothera Research Station. Following two months of deconstructing the old Biscoe wharf, the first frame of the new 74-metre long structure has been lowered into place. Over the weekend, divers completed the final part of the wharf deconstruction along the sea bed, making way for the first 55–tonne frame to be installed on Tuesday. Lowered carefully into position onto temporary guides from a 300-tonne crane, the operation took 12 hours. In relatively warm and sunny conditions, the team worked throughout the evening fine-tuning the frame setting to within 40mm tolerance. This precision engineering was critical to ensuring the alignment for the new wharf, which will provide safe berthing and efficient operations for the new RRS Sir David Attenborough. In total 20 frames will make up the wharf’s skeleton, with seven due for installation during this season by Construction Partner BAM and Technical Advisor Ramboll. 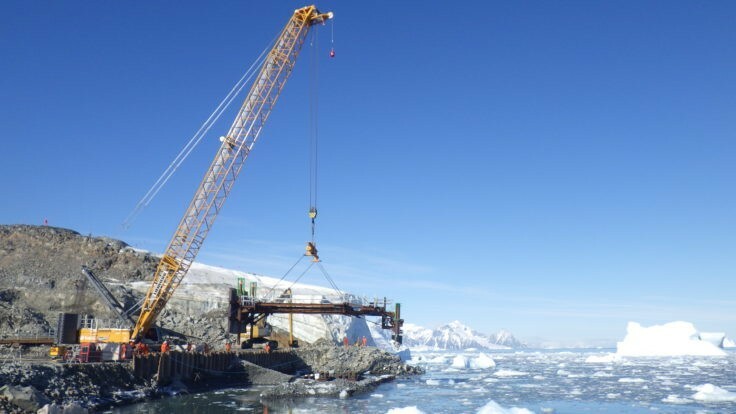 ‘There is a great sense of achievement here in Rothera at this crucial milestone as the deconstruction of the existing wharf makes way for construction of the new wharf. Overseeing yesterday’s successful operation was a very proud moment for all of the BAM, BAS and Ramboll team’, commented Alan Roper, Ramboll Site Supervisor. Precision operation: the 55 tonne frame is lowered onto temporary guides to ensure perfect alignment. Credit Alan Roper. The new wharf at the Rothera Research station will provide safe berthing and efficient operations for the new 129-metre long Polar Research Vessel, the RRS Sir David Attenborough. The commissioning of the RRS Sir David Attenborough is part of a major government polar infrastructure investment programme designed to keep Britain at the forefront of world-leading research in Antarctica and the Arctic. This £200m commitment represents the UK government’s largest investment in polar science since the 1980s. It includes a raft of modernisation across the BAS estate. Supporting BAS is a Technical Advisor team led by Ramboll, which includes Turner & Townsend and NORR Architects, working alongside BAS’s construction partners BAM. Click here for original news story.